A former bookseller friend, who lives in AZ suggested a quilt design for the two memory quilts I'll be working on later this summer. 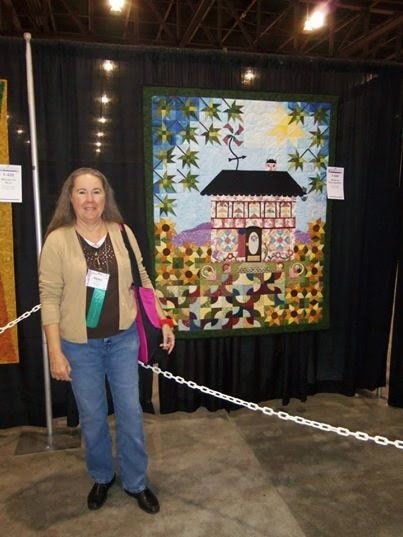 Nancy is a very experienced quilter, here's a photo of her, stolen from FB, that her daughter posted. The quilt was entered in the Arizona Quilt Show in Phoenix. Isn't it fabulous? The quilt design she suggested is Simply Woven Quilt by Jessica Kelly for Moda Bake Shop. The "recipe" makes a twin size quilt and uses two Jelly Rolls. I'm using stash, and chose Tranquility by Michele D'Amore for Benartex. I only have one Jelly Roll, so I cut the "recipe" in half. I'm using black for the background fabric. I got busy with the cutting, and carefully labeled each strip size. Jessica doesn't mention strip-piecing in the directions but I'm thinking that's the way to go. So, I'm off to start stitching. 1 1/4 yard of background solid. from 16 strips cut: (3) 11" strips (48 total), you'll have a leftover 9" strip that you can use for the quilt back design or put in your scrap bin.